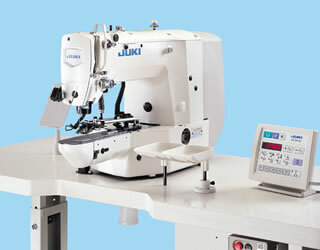 Computer-controlled, high-speed, lockstitch, button sewing machine with 50 different sewing patterns. ♦ Max. sewing speed - 2700 rpm . ♦ Button size( outside diameter )- 8-9; 9-10; 10-15; 10-20; 15-32 mm. ♦ Max. sewing size X-Y: 6,5-6,5 mm. Single-thread, chainstitch, button sewing machine (thread-fray-prevention ). APPLICABLE: For sewing buttons ( shank button, wrapped-around button, snap, label, metal button, stay button ) on men's wear and blouses under different sewing conditions, has been redesigned with its capabilities upgraded. ♦ Button size 10 - 28 mm. ♦ Feed length(crosswise feed) 2.5-6.5 mm. ♦ Feed length(lengthwise feed) 0-6.5 mm. Single-thread, chainstitch, button sewing machine (thread-fray-prevention ). Stitching shape changeover type. ♦ Feed length(lengthwise feed) 0-4.5 mm. Computer-controlled, dry-head, high-speed, single-thread, chainstitch button sewing machine with wiper unit. The machine has 55 different stitching patterns as standard. Is able to independently sew various stitching shapes such as U-shaped stitching, X-shaped stitching and Z-shaped stitching. APPLICABLE: For sewing buttons ( shank button, wrapped-around button, snap, label, metal button, stay button). ♦ Max. sewing speed - 1800 rpm . ♦ Max. lift of the button clamp - 14 mm.